In our first two "Understanding Longboards" blogs we explained the difference between decks in a sea of skateboards, plus the little features that make all the difference. That was just the board - that alone won't get you rolling. You of course need something to mount the wheels under your decks - these things are called trucks, completing your skateboard or longboard with an axle, hanger, bushings and a baseplate. Like boards, they are not all the same so let’s try understand longboard trucks. This is the length along the axle - but from where to where? Truck sizes can be a tad confusing, since some brands measure the whole axle from tip-to-tip, while others measure just the "hanger" - the capital T shaped piece of metal through which the metal rod of the axle is inserted. In general, if a truck size is in inches it is the whole axle, and if measured in mm it’s just the hanger. For example a 180 mm truck is actually about 10 inches in total size. I know, it's bit confusing. Why can’t we all just agree? 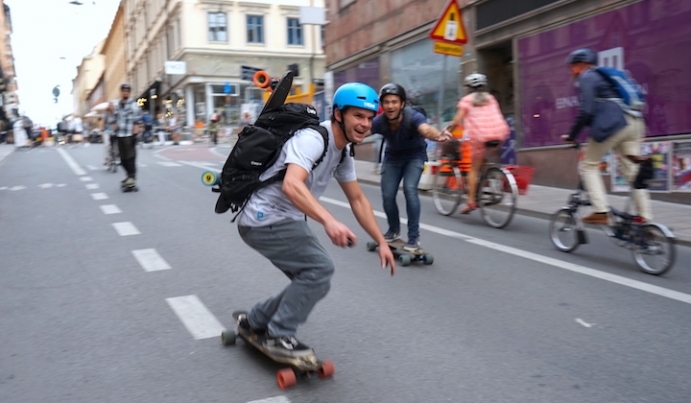 Longboard trucks are wider, usually about 150mm-180mm, made for wider boards. Longboard trucks are usually reversed kingpins (the center bolt on which the hanger pivots), meaning the kingpin faces outwards. Standard kingpin trucks for short boards sit with the screw facing inside to protect it from grinds and whatnot. Reverse kingpin longboard trucks are more responsive and make for a stable ride so it’s perfect for cruising on longboards. The answer is simple. Your axles should be about as wide as your board. A bit less or a bit more length on the truck is ok. If your truck is a bit wider then your ride will be more stable, but your edge pressure will be reduced meaning you need to make a greater of an effort to turn. This can be compensated as you will see below. The opposite is true for a truck that is narrower than the deck: it's less stable but your turns are more effective. Think of old footage of surfers on the first skateboards listening to Beach Boys sidewalk surfing. This is a pretty good truck to board fit below. For a Mellow setup, your front truck should match the rear axle, which is modeled around a 180mm (10 inch) longboard truck. If your front truck happens to be a different size, it’s not the end of the world. If smaller, it makes for more maneuverability and if larger, it will increase stability. If you don’t have a front truck you can get a quality one from the Mellow Candy Store that matches perfectly. How loose you like your trucks is like how sweet you like your coffee. Each person has their own preference. If they are looser, you'll have a more playful ride and can get more carves in, but you risk getting wobbles if you are not applying weight to a turn at higher speeds. If you want more speed, stability and less wobbles tighten then up, but turning will take more effort. It’s actually quite easy to change tightness, so give it a try and see what you like. A bushing is the two pieces of urethane donut on the center kingpin going through the middle of the truck. Varying hardness and snugness (seating) can affect your ride. The more tight & stiff the more stable, the more soft and loose the more swerve. Baseplates are the angled part of the board that holds the truck to the deck. Higher baseplate angles add pressure to give you more carving power while lower ones give you more stability at high speeds. 45-50 degree baseplates are recommended for beginners and people riding under 35 mph. Low degrees is better for avoiding getting caught on stuff like sticks and stones. A final thing to note is bearings. You should take care of them. Pop them out and wipe them down every once in a while and a little oil will keep them spinning nice and smooth, even give you some extra range on your Mellow. You can replace them after putting in a lot of miles, if they get rusty or break, but note that you have to use sealed grease-filled bearings! It's vital to maintaining the waterproofness of the engines in your back wheels. There you go. It’s a lot of information, but if you're a beginner you'll get it once you have a few more kilometers behind you. Ask for advice at your local skate shop or try a friend's setup to get a feel for different options. It’s best to get a skate tool for an all-in-one-solution or else check your toolbox for a resizable wrench or pliers and thin Philips head screwdriver to get the job done.